Enamel teapot. 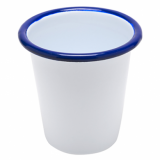 Our new enamelware range offers style, versatility and class to food presentation, with the instantly recognisable white with blue rim creating a feeling of nostalgia and happy memories. 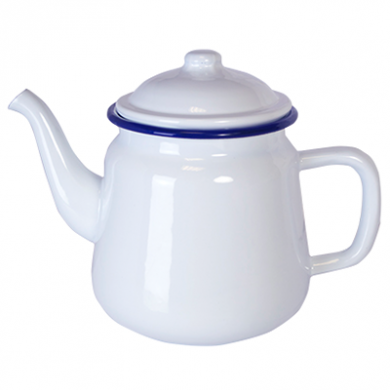 Due to its carbon steel foundation this teapot offer durability and strength - ideal for use outdoors in the garden, family day-outs or camping trips. Box dimensions: 160mm x 155mm x 145mm. Made of carbon steel with enamel coating. Robust, but lightweight and resistant to chemicals. 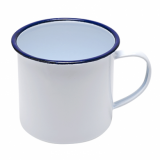 Part of a large collection of enamelware. Ideal for all kind of heat sources, including induction and oven. Durable and versatile - serve drinks or desserts. Great for hospitality purposes and outdoor uses.